Grand Central Market | Press Coverage | The New York Times | By Mark Bittman If you walk in the east side of the recently renovated Grand Central Market in downtown Los Angeles, you are confronted by the snaking lines at the trendy Eggslut, which sells, as far as I can tell, glorified Egg McMuffins. If you walk in the east side of the recently renovated Grand Central Market in downtown Los Angeles, you are confronted by the snaking lines at the trendy Eggslut, which sells, as far as I can tell, glorified Egg McMuffins. If you enter on the west side of the blockwide building, however, you come across a time capsule: China Café, a lunch counter that serves Chinese-American food — egg fu yeung (a.k.a. egg foo yong), chow mein, chop suey and other old-fashioned former standards — to a clientele of mostly Latinos and hipsters. China Café opened in the basement of Grand Central Market in 1959, and moved upstairs sometime later. (The best guess seems to be the early ’70s.) The menu hasn’t changed much over the decades, making it an island of Chinese-American food in the 4,000-square-mile sea of Los Angeles County, home to what is probably the continent’s widest variety of authentic regional Chinese food. China Café’s food is authentic, all right, but it has its roots firmly planted in California. It’s the food that was created by immigrants who were using ‘‘foreign’’ ingredients and cooking not only for one another but also for the tame palates of non-Chinese customers they encountered throughout America. It also happens to have been the Chinese food of my youth, before the first Sichuan restaurants arrived in Manhattan, when chow mein and shrimp with lobster sauce were among the most exotic foods you could eat, even in New York City. In the ’70s, I scorned it; now it has achieved the kind of comfort-food legitimacy accorded to mac-and-cheese: It may not be carbonara, but it’s undeniably good. 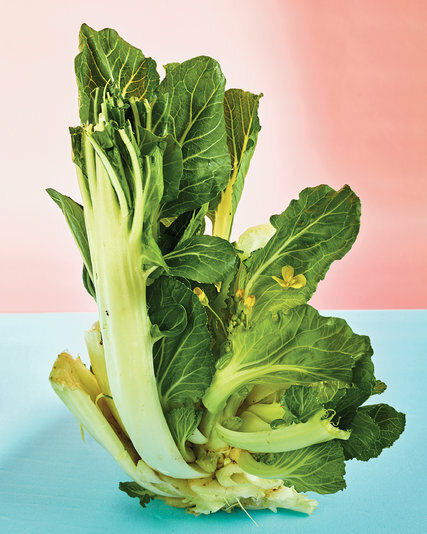 Jie Li began with cutting a large head of bok choy the long way — he wanted to keep the crunchy base as intact as possible — and then washing and chopping it; he does this 100 times a day. Zhen Hui Chen put it in a hot wok (you’ll have trouble duplicating this level of heat at home, but use your heaviest pan and preheat it for a while), added a little chicken broth and covered it. Meanwhile, the men pulled some meat off the bones of the chicken thighs that were simmering to make stock. There isn’t much more to the dish than that. The bok choy is cooked. The chicken is stir-fried with more stock, oyster sauce, a bit of sugar, some flour and sesame oil. The chicken and greens are tossed together and served over rice on a paper plate, a massive portion that is simple, honest and satisfying. This dish seems frozen in time, and yet at China Café, while it is served the same way it always has been, it doesn’t stay that way: The customers themselves have changed it. Few of the Latinos who make up a significant part of the downtown L.A. work force go to Eggslut, but many of them come here. These customers ask for a side of chicken broth with their chop suey (and other dishes). Then they add China Café’s chile sauce and limes — the restaurant now goes through a case a day for this purpose alone — and sometimes avocados they bring themselves. This blend of cultures that has happened without pretense or even planning may not be the ‘‘new’’ Chinese-American food, but it isn’t exactly old-fashioned either. And it’s the best way to cook and to eat, in the end: Make it your own.